We have shown that metatheorizing is an integral part of theorizing in sociology. We have delineated four overarching philosophical frameworks within which sociological metatheorizing is practiced. 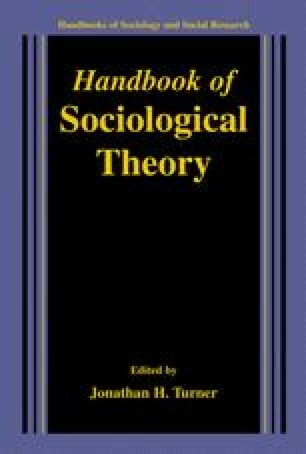 Although positivists, hermeneuticists, and critical theorists would all study theory to gain a more profound understanding of it, to produce new theories, and to create new metatheories, there are differences among them in terms of their relative emphasis on the three specific types of metatheorizing (i.e., MK, Mp, and Mo) and the ways in which they would practice each. For example, while critical theorists would share these three goals, the accomplishment of each would be subordinated to the broader objective of transforming society. While the first three philosophical approaches fit well with the three more specific types of metatheorizing, the same cannot be said about the fourth, postmodern approach. The three specific types all share a very modern orientation toward progress in understanding theory and metatheory. Postmodernists tend to reject the modern notion of progress in general, as well as in metatheoretical work. Postmodernists who study theory tend to have a very different sense of the objectives of such study. While it is possible to look at postmodern theory as a threat to modern forms of theorizing and metatheorizing, it is also possible to see it as offering an array of provocative new ideas that could be used by both. In our exposition we have adopted the latter view toward postmodern theory and see it as offering theorists and all types of metatheorists (and metatheorizing) a set of new ideas and tools that can be used in their work.